In a city that regularly overwhelms the senses, it’s comforting to know that there are numerous green oases that allow you to regather your thoughts, rest your eyes, or simply just relax. And of those beautifully maintained pockets of nature that lie hidden within the city limits, Koishikawa Korakuen is one of my favourite places in which to recharge amidst a sea of green. Nestled quietly alongside the pop mecca that is Tokyo Dome, Koishikawa Korakuen was constructed as a private residence in the early Edo period before being reshaped into a garden by Tokugawa Mitsukuni. Designed in consultation with the renowned 17th confucian scholar Zhu Zhiyu, Korakuen incorporates a circuit-style layout, with a large pond surrounded by varied terrain that draws on numerous Chinese influences. Although the city has urbanised and gathered speed around it, Korakuen retains a sense of serenity that makes it feel like an urban oasis. Along the meandering network of stone paths you’ll find rolling rises, softly shaded ponds and gentle streams that weave underneath tiny bridges – a beautiful series of mini-landscapes that feel like a watercolour painting unfolding before your eyes. Whether it’s gazing out over the iris fields from beneath the pine trees or finding yourself deep within the ume grove, each unique vista acts as a backdrop for your relaxation and respite. 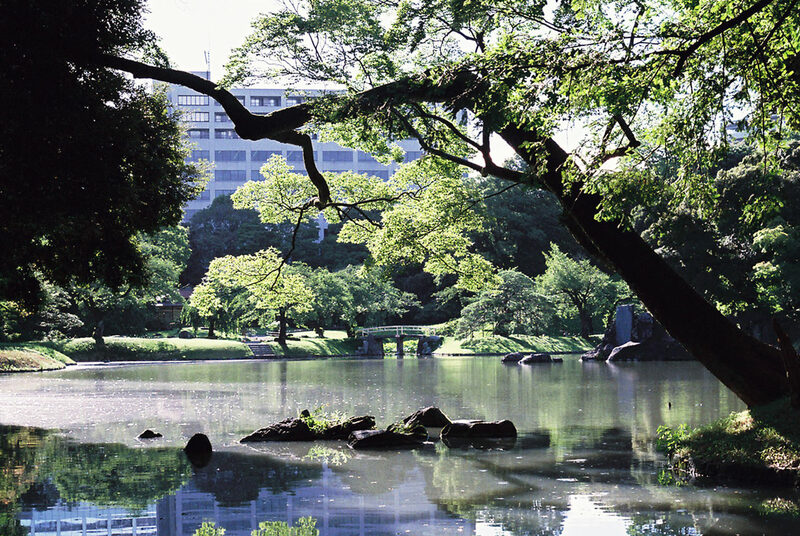 While other green spaces awaken a sense of adventure or border on the semi-surreal, an undeniable sense of calm makes Korakuen well suited to slowness and contemplation. A peace of mind awaits beneath the green-hued canopies, where you can enjoy the simple and natural pleasures that are so often lost on the city’s busy streets and boulevards.